Emiliano Chamorro Vargas (11 May 1871 – 26 February 1966) was the President of Nicaragua from 1 January 1917 to 1 January 1921 and again from 14 March 1926 to 11 November 1926. He was the son of Salvador Chamorro Oreamuno and wife Gregoria Vargas Báez, paternal grandson of Dionisio Chamorro Alfaro and wife Mercedes Oreamuno ..., grand-nephew of Pedro Joaquín Chamorro Alfaro, 39th President of Nicaragua, and Fernando Chamorro Alfaro and half-grand-nephew of Fruto Chamorro Pérez, 30th and 31st President of Nicaragua. Chamorro's first foray into politics came in 1893, when he participated in the failed revolution to topple President José Santos Zelaya. When Zelaya was finally removed in a 1909 coup led by Juan José Estrada, Chamorro became Chairman of the Constituent Assembly and leader of the country's Conservative Party. In reward for his assistance in defeating the revolt against President Adolfo Díaz, Chamorro was appointed Nicaragua's Minister to the United States. In 1914, he negotiated the Bryan-Chamorro Treaty with the United States, by which Nicaragua agreed to allow the construction of a canal across the country, linking the Caribbean with the Pacific Ocean (a canal which has not been constructed). He returned to Nicaragua in 1916, and was elected president. His Conservative Party received United States assistance in attaining power, and Chamorro later partnered with the U.S. During his term in office he made a concentrated effort to pay off the country's creditors. Running again for office in 1923, he was defeated by Carlos José Solórzano. 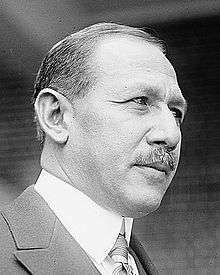 In 1926, he led a successful coup to overthrow Solórzano, but his new government failed to win American support, faced a civil war, and he eventually resigned in favor of Adolfo Díaz. In the following years, Chamorro served as Nicaragua's minister to several European states. Originally opposed to the dictatorship of Anastasio Somoza García, he eventually reached a compromise in 1950 (The Pact of the Generals), whereby the Conservative Party was granted a number of seats in the Congress. This, however, cost him the support of many radical members of the Conservative Party. The portrait of President Emiliano Chamoro Vargas appears in the novel "Spalovač mrtvol", written by Czech novelist Ladislav Fuks and published in 1967, and in the film adaptation Spalovač mrtvol, directed by Juraj Herz and released in 1969. ↑ Kinzer, Stephen (2013). The Brothers: John Foster Dulles, Allen Dulles, and Their Secret World War. New York: Times Books.